Use the Same Thread for All Areas – No Way! I’m currently stitching this charming Princess & Me Ornament. 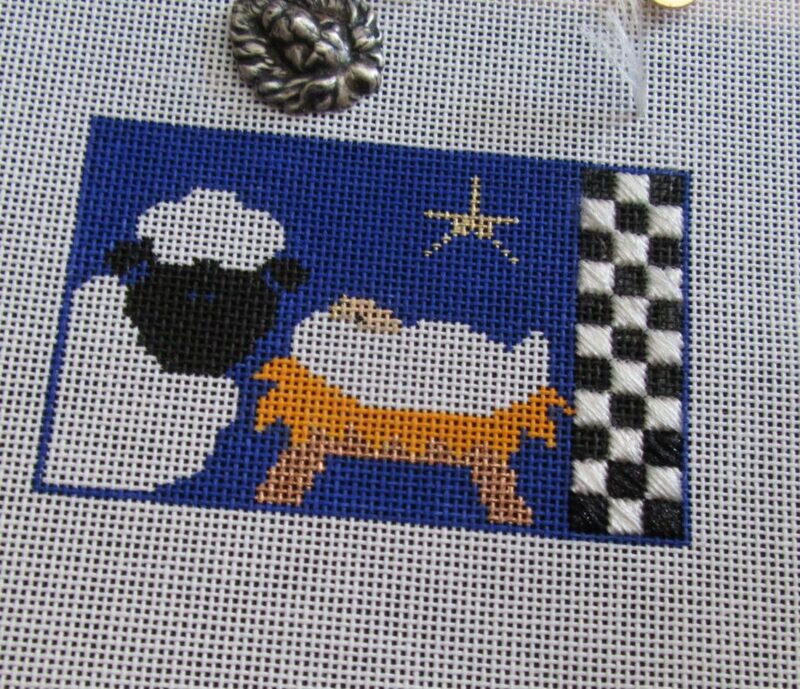 It’s adorable but the picture of the stitched design seemed to use the same thread for all areas painted the same color. While this will work for many canvases, doing this removes one useful tool for the stitcher — thread texture. In this canvas, let’s use white as our case study. Here white is in three distinct areas: the sheep, the blanket, and the checked border. What threads might we use to stitch these if they were on different canvases? The sheep could easily be stitched using a curly matte thread such as Fluffy Fleece. That would give huge amounts of texture just by couching. The baby blanket could use any thread but it might look lovely in a soft, creamy wool, looking like a precious blanket. Another, more rustic, texture would be to use linen thread, looking like swaddling clothes. The border could be any thread you like. The canvas becomes more varied if you use these threads because the threads give you texture. When combined with different stitches and techniques, you’ll get a design that has tons of interest. When possible, I like to have plenty of interest in Christmas ornaments, especially ones that will be gifts. That helps them to stand out on the tree. I love the look of needlepoint when threads carry some of the weight of texture. Even if I am not choosing threads with wildly different textures, picking different threads also gives me some variation in color. White floss or cotton is closer to pure white than white wool. An almost-white silk and wool blend could have pink or green overtones, echoing other colors in the design. By looking beyond a single thread solution, you have treated your needlepoint more like painters treat their painting, you have suited your color to what you are making. Pick threads as if they were on different canvases. Check to see if they work well together. If not, substitute those threads. Consolidate threads if possible. Make silk and cotton floss one or the other, or turn two colors of wool into one. Watch the Sunday Stitching posts to see how this turned out. So where can I get this ornament, please? The ornament is designed by The Princess & Me and can be ordered through needlepoint shops.